Vermillion City Hall is located at 25 Center Street, Vermillion SD 57069; phone: 605-677-7050. Photo: Austin-Whittemore House, ca. 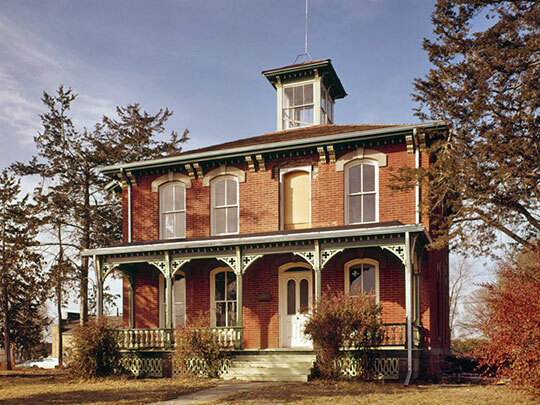 1884, 15 Austin Avenue, Vermillion, SD. Listed on the National Register of Historic Places in 1972. Photographed by Jack E. Boucher, 1976, Historic American Buildings Survey [HABS SD-12], memory.loc.gov, accessed December, 2013. The City of Vermillion was incorporated in 1873. Vermillion, the seat of Clay County and home of the University of South Dakota, is situated on the bluffs above the peaceful Vermillion River, and also overlooks the turbulent Missouri. The town was so named because of the red clay obtained from the banks of the river. In 1835 a trading post called Fort Vermillion was built by the American Fur Company on the banks of the Missouri River, and in 1843 Audubon, the famous naturalist, visited the post and the trail now known as the Ravine Road in the present city. A colony of Mormons, enroute to the Rocky Mountains, spent the winter at the fort in 1845-46, but the site of the fort has been washed away by the bank-eroding Missouri. When the Homestead Act went into effect Jan. 1, 1863, settlers moved in to stake claims along the valley. A settlement was started on the flat where the Vermillion and Missouri Rivers join, and the new town boomed. But in 1881 a flood roared down through the lowlands, sweeping away 150 buildings in the young city and leaving the rest in ruins. There was not a single life lost, however, as residents climbed to the high bluff and watched their belongings and five bridges float down the swirling river. The result of the flood was twofold : a new city was built high on the bluffs, and the Missouri cut a new channel four miles South, creating a large island. The University of South Dakota, adjacent to State Route 50 on Dakota St., is an important factor in the development and growth of the State. Through the research work of its laboratories and the expert services of its staff, the University contributes widely to the development of wealth and culture in the State. In 1862 the first Territorial Legislature established the University, but failed to provide any funds. Succeeding legislatures refused to make an appropriation, and 20 years later the citizens of Vermillion decided to take energetic action. The site was selected and the first 10 acres donated by Judge Jefferson Kidder. The county commissioners called an election to approve a $10,000 bond issue for the construction of one building. Although the building was not yet finished, the fall term opened in 1882 in the court house. The faculty consisted of one man, Dr. Ephriam N. Epstein, a Russian Jew who had become a Baptist clergyman; the student body numbered 39, but increased to 69 before the end of the first year. The next year the faculty was doubled, and the Territorial Legislature voted its support to the extent of $30,000. Since 1882 the University of South Dakota has graduated more than 3,200 men and women and has trained thousands of others for service to the State. It comprises nine main divisions, more than 100 faculty members, and an average annual enrollment of 1,600 students. Through its various schools and colleges, it offers courses in nearly all of the accepted fields of modern university, training. The original plan for the campus was a semicircle, but the founders failed to realize the space needs of future growth. The buildings are now arranged on the 69-acre campus with more regard to convenience than symmetry. There is no uniform type of architecture. The Library and Law Building, of Colonial type, are built of Bedford limestone. English tendencies are noticeable in other buildings. Old Main, East Hall, and the Old Armory are constructed of Sioux Falls quartzite. All the others are brick.